Apologetics Press - Where Does the Ice Age Fit in the Bible? Where Does the Ice Age Fit in the Bible? 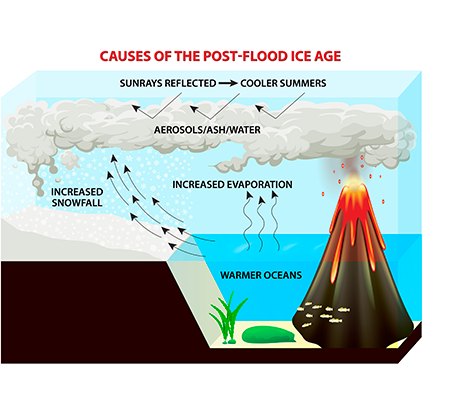 An Ice Age After the Flood Explains A Lot! Were Beavers Once Bigger than Humans? Have you learned about the Ice Age in school? Perhaps you’ve seen the many kids’ movies about the Ice Age that feature a woolly mammoth nicknamed “Manny,” a ground sloth nicknamed “Sid,” "Diego" the saber-toothed cat, and "Scrat" the “prehistoric” squirrel? Did the Ice Age happen? If it did, how does it fit with the Bible? Why do scientists believe an Ice Age happened? 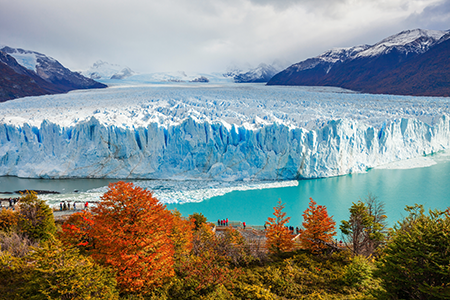 As glaciers move today, scientists can see the effects of their movement. When they find those same features elsewhere, they believe that glaciers were probably once there, too. For instance, glaciers are not made solely of ice. They also have rocks, dirt, plants, and sometimes even fossils frozen within the ice. As the glacier grows (from the formation of more ice) or contracts (from melting), it moves. The rocks that are trapped within the glacier at its base scratch the Earth as the glacier moves. 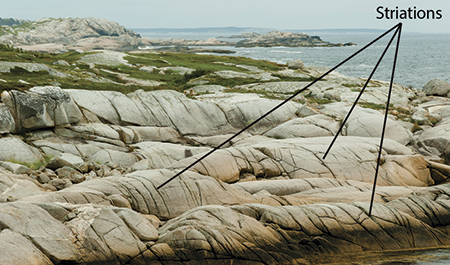 These scratches that run side by side are called “striations.” They occur on rocks that extend over miles and miles of plains. Have you ever played with a toy bull dozer? What happens to the dirt as the bucket (the “blade”) scrapes the Earth? Some of the dirt gets scooped up. But what happens to the dirt that doesn’t get scooped up? The effect of your bulldozer’s movement will be piles of dirt on each side of the blade as it moved and a pile of dirt in front of it where it stopped. The same piles of dirt [called till and moraine (muh-RAIN)] are left as a glacier moves. Based on evidences like rock striations, till, and moraine, scientists believe that as much as 30% of the Earth’s land surface was once covered with ice (as opposed to 10% today). The ice at the poles once extended much further than it does today. Scientists call this period of time the Ice Age. [Actually, many evolutionists incorrectly believe that the evidence supports several ice ages over millions of years—not just one over hundreds of years.] The evidences for the Ice Age are found in the rock layers that are found above the rock layers typically understood by Creation geologists to be the Flood layers—that is, after the Flood. What are Bible-believers to make of such evidence? Does the Ice Age fit with the Bible? Definitely. We know that the Flood was a worldwide water catastrophe. The ocean floor apparently broke up (Genesis 7:11), releasing lots of heat and magma into the oceans. Mountain building and volcanic activity happened quickly (Psalm 104:8, ESV). The result would have been that the oceans were much warmer during and after the Flood for a period of time. Warmer water means more evaporation (liquid water turning into steam/cloud), which means more rain and snow. More volcanic activity means more ash and aerosols in the sky, which would block out more sunrays. That effect would lead to cooler summers with less ice melting each year. Until the oceans began to cool off again, the ice and snow at the poles would continue to advance, causing the Ice Age to occur over, possibly, several hundred years after the Flood. Cooler summers coupled with more moisture in the air and a “persistence” of those two features would likely have triggered the Ice Age and would explain the physical evidence. Bottom line: evidence for the Ice Age is actually evidence that the Flood happened! As is always the case, the scientific evidence does not contradict the Bible. We may not always immediately understand the evidence we discover, but when we study further, we continue to find more and more powerful evidences that support what the Bible teaches. Copyright © 2019 Apologetics Press, Inc. All rights reserved. Did God intend for humans to form a government? What then does the Bible say about the purpose of the divinely authorized entity of human government?